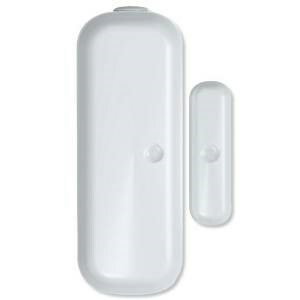 Aeotec door and windows sensor to allow to detect if windows is open or closed. We always think of tools in our house as ‘doing things’. Switches turn lights on. Remotes turn TVs off. Things do the basic stuff we tell them to – nothing more, nothing less. That’s a description of a house of the past. The house of today has intelligence built in. Or at least it should. Inspired by the humble thermostat, Aeotec’s Z-Wave Door & Window Sensorsits as a part of our Intelligence range. Like a thermostat, we’ve designed it to find things out, to understand things about your home, and to then use that information to make your home more comfortable, to make your life easier. The Door & Window Sensor finds out something very simple – whether a door or a window, or in fact any object in your home, is open or closed. But there’s power in simplicity. Power that allows you to inform the rest of your Z-Wave network about your selected doors and windows. Like a thermostat lets your heating and cooling systems know what they should do next, Aeotec’s Z-Wave Door & Window Sensor does the same. Perhaps an open door means that your lights should turn on and welcome you home. Perhaps an open window means that an alarm should be trigged. Whatever it means to your home, with door and window sensors installed, your Z-Wave network will have both the power and the itelligence to do it. The Door & Window Sensor is completely wireless. Despite its small size, it’s powerfully so. It uses a special Z-Wavewireless signal that aims to cause no interference with other technologies in your home. That same wirless signal is ultra-low power, helping the battery last for years. And it does all of this with an antenna that can communicate over 300 foot / 90 metres in an open space. It attaches to your doors. It attaches to your windows. And, despite its beautiful curves, you don’t want to notice it. You want the Door & Window sensor to blend in, to become part of your home’s décor. That’s why we’ve made the 2nd generation sensor smaller than the first. We’ve reduced all its measurements without reducing its functionality. It’s smaller still, and it just looks better. The Door & Window Sensor is light. So light, in fact, that you can install it using only double sided sticky tape. Of course, there are other options, including screws. And you’ll find them all in the packet. All you’ll need is a screw driver and five minutes of your day. Changing batteries is inconvenient. Forgetting to change batteries on a sensor that can be used for security can be dangerous. That’s why we designed the Door & Window Sensor to use as little power as possible, with an average of 2 years passing before you need to change its batteries.